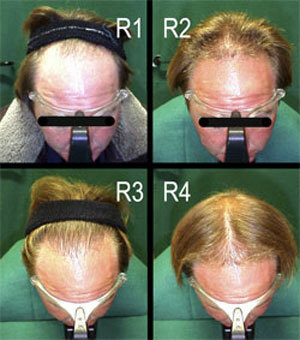 In Brussels, a hair transplantation clinic completes our services to those who care about balding. Minimally invasive transplantation techniques (MITT) are routinely used for hair restoration in androgenetic alopecia. Some people consider that common baldness is not a disease, this should not mean that there is no cure! Nowadays MITT guarantees long-lasting natural looking hair and definitive regrowth without visible scarring. At the Brussels’ Hair Clinic, MITT is provided as a service by specially trained and qualified physicians. Micro-sampling performed during the MITT procedure means a significant progress for the conservation of the quality of the donor site as it leaves no visible scarring; a significant progress when subjects notice a donor-site scar after classical strip sampling (two cases below). Microtransplants generate a natural looking frontal hairline.